The 2017 Police dog Alliance assessments were held over 3 days between 20 and 22 of November. The assessments involved 7 dog teams from Dorset, Devon and Cornwall. Personal pride was at stake not to mention trophies for the most successful and the top 3 dog teams would represent the Alliance at next year’s Regional Police dog assessments. PC Darryl Drew and Police dog Boris are stationed at Exeter. Boris is from our B litter born on the 19th of November 2013 and is one of our elite Firearms support dogs. Boris was initially puppy walked by Lin and Ken Kennedy in Cornwall. Tragically Ken died unexpectedly and Boris then had further puppy walkers Phil and Mel Rooks and Ali and Rob Kingdon. PC Terri Davies and Police dog Salvi are stationed at Plymouth. Salvi was born on 7th November 2014 and was purchased as a young pup for our program. 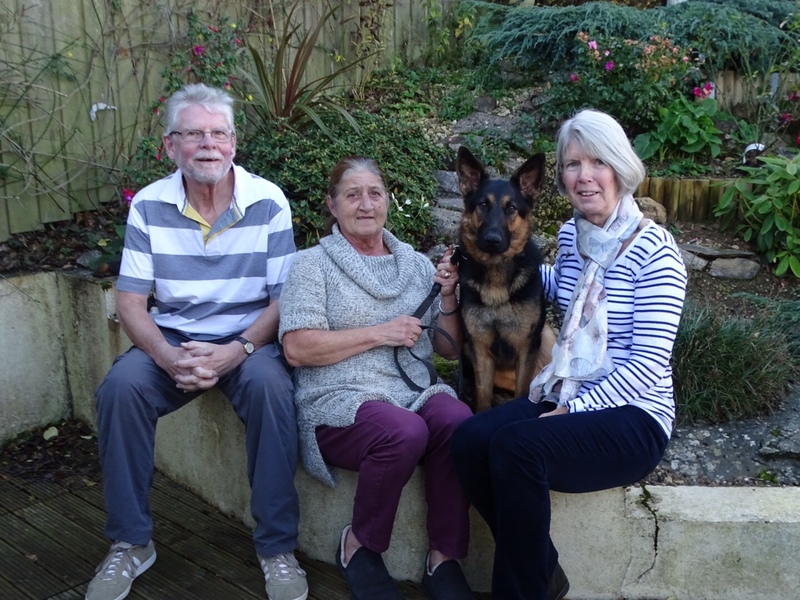 Salvi was puppy walked by Force dog trainer Graham Attwood and his wife Lucy. PC Mike Green and Police dog Blade are stationed at Weymouth Dorset. Blade was also from our B litter born on the 19th of November 2013. Blade was puppy walked by Emma Osborne in Exeter. PC Lee Briggs and Police dog Shadow are stationed at Ferndown in Dorset. Shadow was purchased as a pup from breeder John Smith and was born on 26th August 2012. Lee and Shadow were the 2016 Alliance Police dog trials champions. Shadow was puppy walked by Annie Millar in Cornwall. PS James Little and Police dog Cosmic are stationed at Camborne. James is the dog section supervisor for Cornwall. Cosmic was from our C litter born on 20th May 2014. Cosmic was puppy walked by Lyndsay and Anthony Lane-Lobb in Plymouth. PC Ben Jobes and Police dog Ash are also stationed at Camborne. Ash is from our A litter born on 3rd June 2013 and is also a Firearms support dog. Ash was puppy walked by puppy walker Annie Millar in Cornwall. The assessments (formerly called Police dog trials ) are held annually involving the teams who have won through their local area assessments. The teams are assessed on the broad spectrum of the skills needed to be an operational Police dog team. I was very excited to be invited to judge the teams over the 3 days for a number of reasons. I had acquired Shadow and Salvi as pups and with the assistance of my wife Diane I had bred Annie, Ash, Boris, Blade and Cosmic at our house. I watched them all develop with their puppy walkers and in the case of Annie, Ash, Boris, Blade and Cosmic I was the Instructor on their Initial courses. As keen as the dogs were to do their work it was nice to see that they still remembered me when they met me again as Blade demonstrates here. The assessments were divided into 3 phases. The 1st phase is the nosework section and assesses the dog’s ability to follow the trail of an offender one and a half hours old. The trail is half a mile long with multiple changes of direction and with 4 very small articles hidden on the trail which the team must recover. Here is Lee and Shadow on their track which was very successful. They are pictured here being given their de-brief at the end of their phase 1 performance. As you can see like any good Police dog Shadow was more interested in the chance of further action. Then like the character he is he decided after getting a sweat on it was time for a spot of cooling down. After completing the track the teams must then deal with an offender who tries to flee the scene by running away when challenged. As the dog chases, the fleeing criminal will stop running and surrender. The dog should NOT bite the criminal but should keep him/her there by barking until his/her hander arrives. We call this exercise the Stand Off. Mike and Blade are pictured here having successfully detained their offender and a full search of the offender must then take place to make sure the offender is not concealing a weapon or evidence. Having dealt with the fleeing offender there is one final exercise to the phase where the team then have to search and locate 4 further items of property hidden in a designated area. The dog must indicate to the handler if he/she finds an article or item recently handled and must not touch the item to preserve any DNA that may link the offender to the item. Here is Blade setting off to search and having found an item lies down next to it waiting for his handler to take possession. Due to persistent rain in the morning it was not possible to obtain decent photos of Boris, Annie and Salvi. The Cornwall competitors James Little with Cosmic and Ben Jobes with Ash did their Phase 1 the following morning and it is no exaggeration to say they were outstanding. James and Cosmic won the Tracking section with a score of 155 out of 160 marks. There is no doubt winning the Tracking exercise is the one section that all handlers want to win because to be a successful operational team you need a top tracking dog. Having successfully completed his work with Cosmic James was able to relax and watch another competitor doing his work. 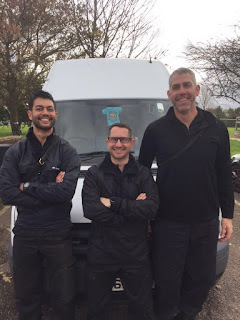 Pictured with James are Cornwall handler Darren Tenby ( On the left ) and Cornwall and Plymouth environmental trainer Tim Goodwin ( On the right ) who both helped at the trials. The handler they were watching was fellow Cornwall handler Ben Jobes with Police dog Ash. James had a special interest because Ben and Ash were neck and neck with James and Cosmic as they were about to do their property search. A good property search by Ben and Ash would mean that they would win the Phase. That is exactly what happened, Ben and Ash scored an incredible 96 out of 100 on their property search and deservedly won the phase 1 cup. James wasn’t worried because Cornwall had won both the Tracking trophy and the Phase 1 cup. Setting them up nicely for the rest of the competition. The second Phase of the competition involved searching a public house where 3 suspects had been seen to climb in through the roof of the building. The handler had to use his/her dog to search the building in a systematic and controlled manner to locate and arrest the suspects. The building had areas where it was in total darkness. During the search the handler was taken by surprise and attacked by an armed criminal to test the courage of the dog in defending his/her handler. The winners of this phase were Darryl Drew and Police dog Boris. There was very little to separate the 7 teams who all performed extremely well and all scored highly. I thought that Boris searched with such a determination that there was never a doubt that if someone was hiding in the building he would find them. He was also very impressive in the no nonsense way he dealt with the violent criminal. Boris is more than capable of demonstrating control when he needs to but he is always ready for action. The 3rd phase on day 3 assessed the Teams on a wide range of skills such as negotiating obstacles, heelwork, general control, and their ability to deal with conflict resolution which included dealing with a fleeing offender, an offender armed with a stick, an offender armed with a gun and the ability to recall their dog from chasing a fleeing criminal. 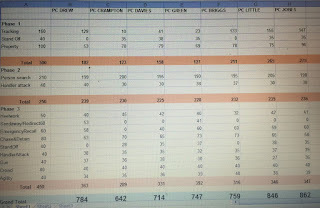 Ben Jobes with Ash and James Little with Cosmic were 1st and 2nd on the leader board going into this Third Phase but with nearly half of the overall marks allotted to this phase there was still plenty to play for. First up was Darryl and Boris pictured here doing their heelwork. They had a very good round which saw them finish 3rd overall in the competition. As I debriefed Darryl he was keeping a tight rein on Boris who was still looking for further action. Next was Lee Crampton and Annie pictured here doing the hurdle. I know just what an excellent standard this team have and at the start of the competition were more than capable of mounting a challenge. 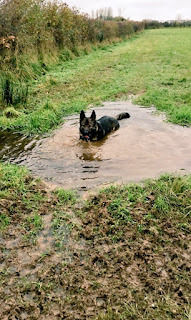 But as so often happens in Police dog trials even the best dogs have off days and so it was with Annie failing to get away on the tracking exercise leaving a mountain to climb. That’s trials as they say. Annie is pictured here having just made the long jump look ridiculously easy and later dealing positively with the gun criminal. Next was Terri Davies with Salvi who was the youngest dog in the competition and a dog she re-handled from previous handler Chris Curnow. Salvi is pictured here doing the scale jump. He performed an excellent chase, stand- off and barking when the criminal gave himself up. I wasn’t sure what was happening here because although it may have looked as though Terri had encountered a stray bullet from the gun criminal that certainly wasn’t the case as we only use blanks. She soon recovered to show what excellent control she has with Salvi before sending him on the straight chase. Blade is very similar in character to his litter brother Boris in that he is very excitable and very lively. This makes him a difficult dog to control and settle in competition situations plus Mike is a first time handler. This made his performance with Blade all the more remarkable because not only did he handle Blade superbly the team went on to win the phase 3 trophy by quite a wide margin. Blade is pictured here waiting under total control and then being sent to perform the chase and detain exercise. Blade is pictured here making an immediate return to handler after being commanded to cease the chase in the emergency recall. Next was Lee and Shadow who we know are very capable having won the competition together last year. This wasn’t to be their year but they were as professional as they always are throughout the competition. Since their Initial Police dog course this team have gone from strength to strength. 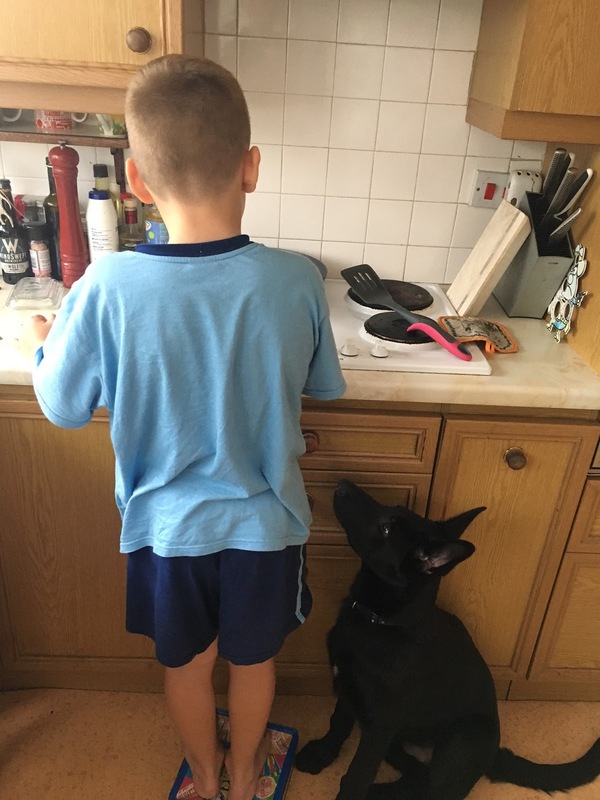 Cosmic has never been the toughest of dogs but because of his lovely temperament and tracking ability James has supported him every step of the way and they are an excellent example of just what can be achieved with a handler who loves his/her dog and develops a strong bond. Going into this phase James and Cosmic were only 15 points behind leaders Ben and Ash. James and Cosmic put on a superb Phase 3 performance and although they didn’t quite manage to overhaul the lead that Ben and Ash had over them they still finished as the runners up in the whole competition. Finishing runner up in your first Police dog trial is an outstanding achievement particularly with a score of 846. Ben and Ash performed as well as any dog team that I can remember on their part 1 phase. Their track was exceptional and it was easy to see why they are so successful operationally. From there they performed consistently well on the remaining 2 phases and were worthy and deserved overall champions.. Here is Ben being presented with the Chief Constables cup by Chief Supt Jim Nye in charge of Operations. James and Cosmic were the runners up and James is pictured here collecting the runners up shield. Ben ( Handler of Ash ) is pictured here collecting the Phase 1 winners cup. Darryl ( Handler of Boris ) is pictured here collecting the Phase 2 winners cup. Mike ( Handler of Blade ) is pictured collecting the Phase 3 winners cup. 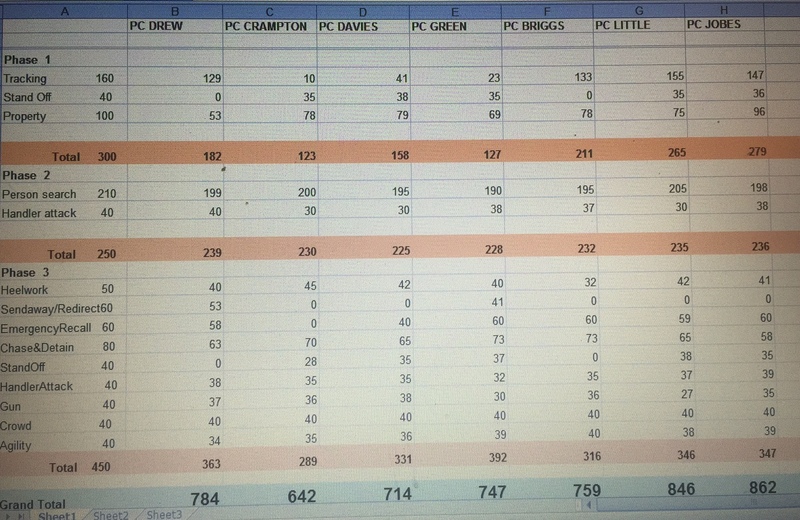 Here are all of the handlers scores. Our winner Ben and Ash, runner up James and Cosmic and third place team Darryl and Boris will now represent the Alliance at the Regional Police dog trials next year. We are grateful to Chief Supt Nye for his support in taking the time out to present the trophies to all of our winners. This was my first go at judging a Police dog trial and I know my steward Hugh has never stewarded before so somehow we managed to bumble on through. My thanks to Hugh and all of the criminals, helpers, tracklayers for helping with the trials. Normally I take all the photo’s for my blog but couldn’t this time as I was judging. It was a big mistake giving my camera to a dog handler to take the photos because this then happens. I think we can safely say that Graham certainly hasn’t had any work done. I would like to thank Ian Shacklock and his family of MTF driver training consultants for allowing us to use his land and facilities and their hospitality at the Phase 1 venue. I think special thanks should go out to Phil Wilson for all of his hard work in organising the whole event. Finally I was very impressed with the extremely high standards that I witnessed which is the result of a lot of hard work by the handlers and our trainers. But what gave me the most pleasure was the compassion, bond and close relationship that all of the handlers demonstrated with their dogs. You were all a credit to the section. I'm still scratching my head trying to work out how this rather strange individual managed to mastermind this result for Cornwall dogs. Good luck to everyone at the regionals. In our last blog the course had successfully completed week 2 of the 13 week course and at that time the line up from left to right were Steve and Rudy, Course Instructor Graham with spare dog Ozzie, Kevin Roberts with Devon and Kevin Riger with Danno. Since then Steve has injured his knee which meant he is unable to complete the course and will now return on the January 2018 course with a new dog. If that wasn’t enough TPD Danno has been released from the course. 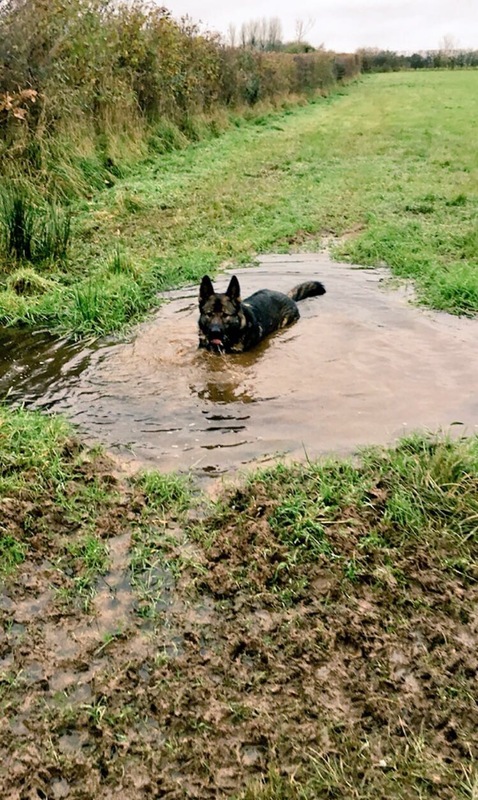 We found that as the course progressed and the level of difficulty increased he didn’t quite have the determination and commitment required to be a Police dog. Danno’s handler Kevin has now been allocated Rudy. Several weeks ago one of our operational Police dogs Bolt had to retire from service due to a back condition aged 7 and so his handler Phil Sim joined our course and was allocated spare dog Ozzie. Here is the new line up. From left to right are Kevin Riger & Rudy, Course Instructor Graham Attwood, Kevin Roberts & Devon and Phil Sim & Ozzie. All 3 teams are progressing nicely and are well on schedule for their licensing assessments in 2 weeks’ time. 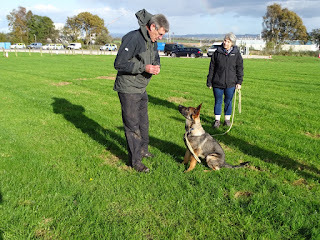 Last week the course were joined by Devon’s puppy walker Lyndsay. She hadn’t seen Devon since he left her in June to go to his handler Kevin. Here they are being reunited. 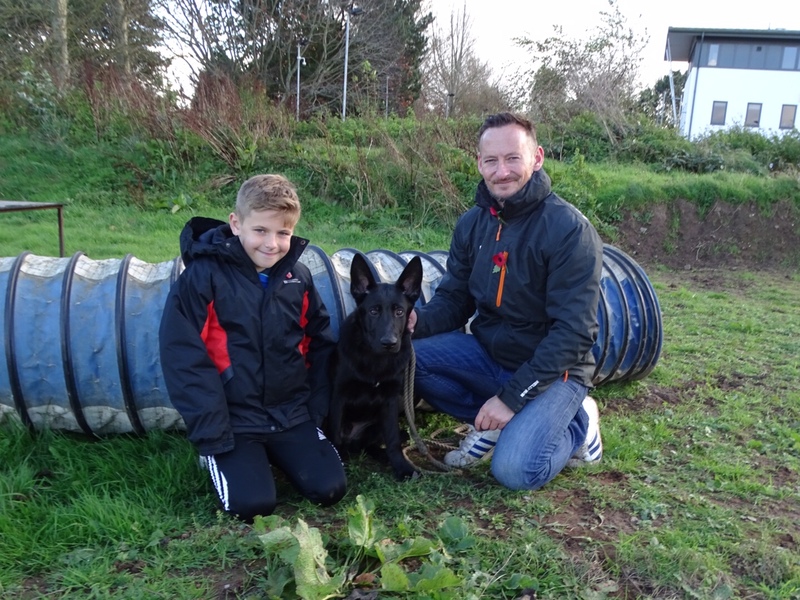 We also had another surprise because also visiting the course for the day was Sgt James Little with Police dog Cosmic. Lyndsay also puppy walked Cosmic. 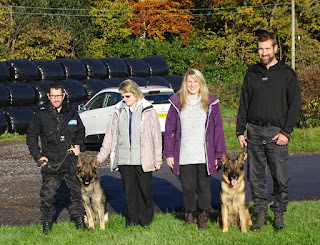 Here is Lyndsay with her boys Devon on the left and Cosmic on the right with handler PS James Little. 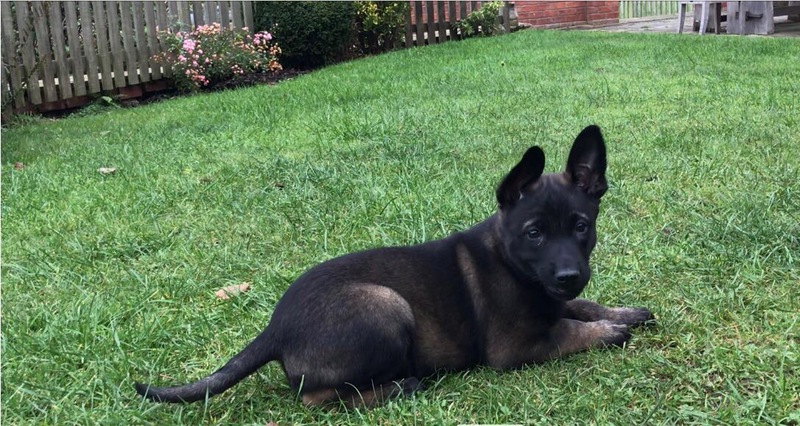 We encourage all of our puppy walkers to join us during the course to see their pup progressing and also to attend their pups passing out parade. I will include a blog of the dogs undergoing their licensing assessments and the passing out parade in 2 weeks’ time. Here are the teams and some pictures of their work in recent weeks. Big Phil Sim and Ozzie have been together for just over 4 weeks and are making excellent progress together. 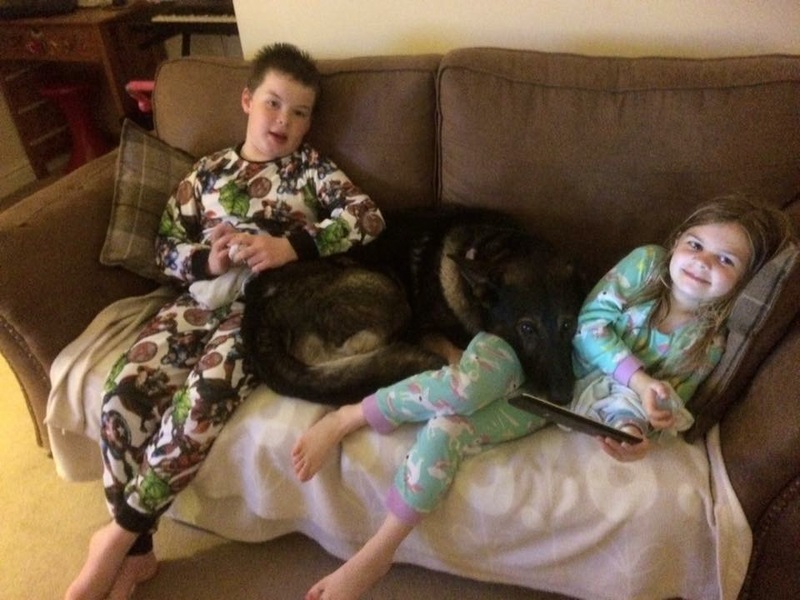 Phil was obviously very disappointed that his Police dog Bolt had to retire prematurely at 7 but because of Bolt’s excellent temperament Phil was able to find new forever home near to where he lives and as you can see Bolt is more than happy in his new home. Phil and Ozzie are bonding well together and here are a few pictures of their work. Phil and Ozzie locating a wanted offender who decides to try and escape. Big Phil helps Ozzie over the high jump to spare Ozzie’s growing joints any unnecessary stress. 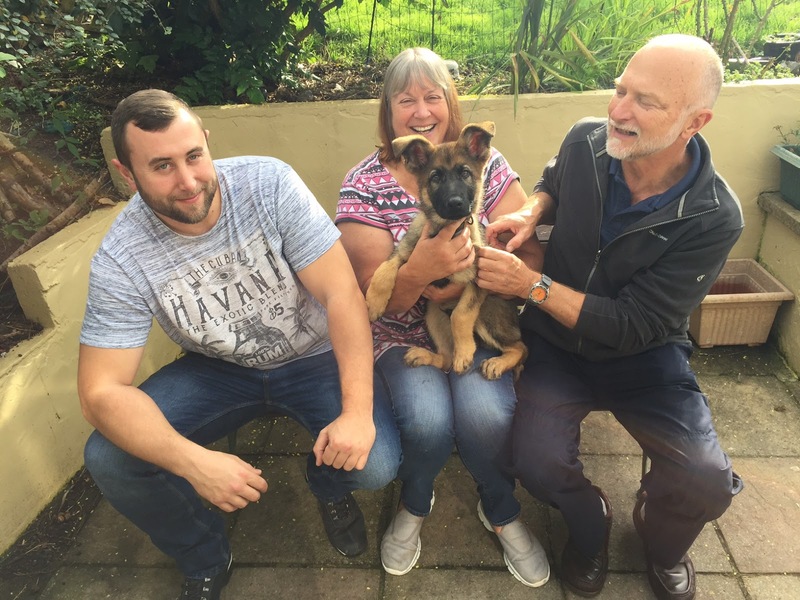 Despite working so hard to succeed with Danno first time handler Kevin was obviously disappointed when the decision was made to release him particularly as they had been together for nearly 4 months. Kevin has developed a bond with new dog Rudy and whereas Danno didn’t have enough determination Rudy’s enthusiasm and energy knows no bounds. Kevin has had to develop a different set of skills in managing such a high drive dog. Here are the team setting off on their track to try and locate an offender who has made off and needs to be found. Half a mile later one outstanding criminal detained. Making the long jump look very easy. PS Kevin Roberts is also a first time handler and has been with Devon since he collected him from puppy walker Lyndsay in June. Devon has performed consistently well on all of the disciplines throughout the course and just like his father Lenny Devon is already an outstanding tracking dog. Here he is showing his determination trailing and locating his Quarry who then attempted to escape. He also then demonstrates excellent control and surveillance as his handler searches the criminal. Puppy walker Lyndsay then joins her boy to congratulate him on a job well done. So we wish our 3 Musketeers the best of luck on their assessments. Pictured above are our 4 new additions to our puppy program. Since our last blog I have been busy acquiring these pups and this Sunday was our first opportunity to get all 4 pups together. From left to right are Merlin, Quest, Peppe and Quini. In October I travelled to Belgium to collect Quest and Quini who had been bred by Walther Verbruggen. I had previously travelled to see the litter and select our 2 pups but due to the Rabies laws I was unable to bring them back to England until they were 15 weeks old. When they were 15 weeks old I brought them back to my house to assess them and prepare them for their puppy walkers. Here they are in my garden. Here is a short video of the two of them exploring their new surroundings. Quest has been allocated to Colin and Mitzi who have previously puppy walked Beckie, Chaos and Danno. Here he is on his first training day already showing excellent concentration. Quini stayed with me and Ella for a few more weeks. Quini has since been allocated to Terri, Mark and their 2 boys in Plymouth. Next it was time to collect Peppe from Holland. Pepe was bred by Koos Hassing of Tiekerhook breeding who also bred Rudy currently doing exceptionally well on his Initial course with handler Kevin. Here is Peppe at my house about to leave with his new puppy walkers Chris and partner Lyndsay. They are first time puppy walkers. 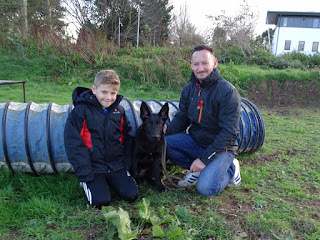 Here is Peppe with Chris and his son Henry on his first training day. Henry and Peppe are already the best of buddies particularly when Henry is making pancakes. Lastly I acquired Merlin from Jamie Evans in Liverpool. Jamie had purchased Merlin from Ian Morgan of Lorockmor working dogs who bred him. Jamie hadn’t been able to resist purchasing this lively enthusiastic little man but quickly realised with a young family a very lively female Dutch herder and Jamie’s wife expecting a baby any day now purchasing Merlin had been a mistake. My friend Richard Evans ( Who bred our pups Ozzie, Ollie & Oscar ) alerted me to his availability and once I met Merlin he was very quickly in my van on his way to my house. You can see it didn’t take him long to settle in once he arrived. He was a little ribby when he arrived but once he was allocated to puppy walker Aunty Lyn Parlour and her home cooking that soon changed. Merlin is certainly a character who was very easy to get a speak on command for his toy. 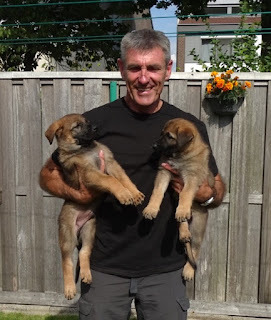 They will soon be joined by Henry the herder aged 8 weeks who I am collecting from his breeder Ian Morgan of Lorockmor working dogs this Thursday. The ongoing problem of hip dysplasia continues to haunt us with Tammy and Garry both having the complaint. Tammy’s was detected when she went for her routine x ray at 12 months before allocation to a handler. Garry had been showing some laxity in his movement at 6 months and so we had him x rayed as a precaution. Here is Tammy with puppy walker Margaret centre and new owners Carol and Colin collecting her before leaving for their home in Hayle where they live with their Poodle called Darcy. She has settled in nicely and is doing well. 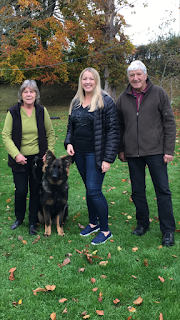 Here is Garry with puppy walkers Terry and Jill with new owner Stephanie ( centre) just before leaving for Dorset where she lives with her husband an ex Police dog handler. We had over 700 responses to offer him a home. Danno is still staying with me after an unsuccessful attempt to rehome him in Maidstone. He does sometimes take exception to people he doesn’t know trying to stroke or engage with him when he is on lead. He is absolutely fine with the people he knows but I need to try and school this problem out of him before I can find a suitable home for him. 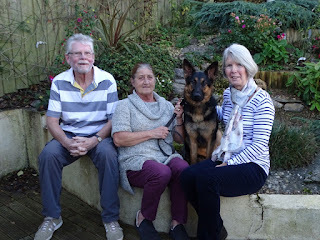 Here he is recently with puppy walkers Mitzi and Colin. Finally I would like to highlight Chris for his efforts and support towards his pup Peppe. Peppe suffers terribly from car sickness and on getting to training this Sunday he was a little cautious and unsure on the going through the agility tunnel. Without any prompting from me the irrepressible Chris set up his own little circuit in the garden to build Peppe’s confidence. Next blog will feature the results and pictures of this week’s Police dog trials.